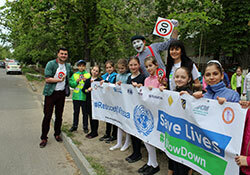 Children at the "Stefan cel Mare" Lyceum in Chisinau, reminded drivers of the importance of safe driving and following speed limits in school zones, as part of Road Safety Week activities in the Republic of Moldova. Road traffic injuries are the leading cause of death for people aged 5–29 years in the WHO European Region. The “Global status report on road safety 2015” indicated that almost 85 000 people – more than 230 every day – died from road traffic injuries. Globally, speed contributes to around one third of all fatal road traffic crashes in high-income countries, and up to half in low- and middle-income countries. The Road Safety Week thus focused on speed management, thereby saving lives on the roads. raising awareness about the dangers of speeding. To increase understanding of the dangers of speed and generate action on measures to address speed, the Road Safety Week called for intersectoral actions where all stakeholders – national and local governments, international agencies, civil society organizations, private companies and the public – were invited to plan and host events marking the week. This year, 43 Member States of the Region engaged in about 190 events. WHO/Europe actively supported 19 countries in their initiatives. Activities ranged from high-level events with ministerial participation in Malta and Montenegro emphasizing the dangers of speed, to press conferences in the Czech Republic, Hungary, Kazakhstan, Kyrgyzstan, Tajikistan, Ukraine and Uzbekistan which highlighted road safety issues and announced the provision of more training for young and novice drivers. In addition, other activities included engaging young people and school children in the Russian Federation and Serbia, holding a poster competition in the former Yugoslav Republic of Macedonia and a painting exhibition by children in the Parliament of the Republic of Moldova. Social media awareness campaigns were also held during Road Safety Week in Romania and Bosnia and Herzegovina. These campaigns used leaflets, video spots and testimonies to underline the dangers of speeding and the relationship between speeding and road injuries. Local traffic police were actively involved in the Road Safety Week through education campaigns in Albania, the distribution of brochures with information regarding speeding in Belarus, and a police band concert in Turkey. Road Safety Week activities were aligned with the 2030 Agenda for Sustainable Development, which acknowledges the critical importance of multifaceted interventions for better health. Among the health priorities, two sustainable development targets are related to road safety: Goal 3.6 seeks to reduce road traffic deaths and injuries by 50% by 2020; and Goal 11.2 aims to provide access to safe and sustainable transport systems.